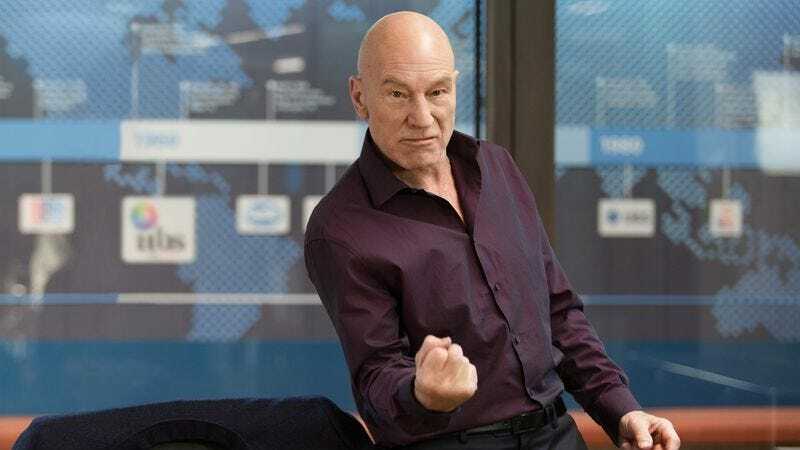 Sometimes it’s like Blunt Talk is daring itself to find a situation where Patrick Stewart cannot be funny, just to watch the old starship captain succeed anyway. Is Patrick Stewart funny when he’s unfolding a toilet seat cover? Yes. Is Patrick Stewart funny when he’s likening his own newsroom to “Stalin’s Russia”? He is. What about when he’s watching some preschoolers sing a song? Still funny. In his role as the narcissistic cable news host Walter Blunt, Stewart can do no wrong, and as such Blunt Talk leans on him to carry an otherwise hit-or-miss ensemble. He shoulders this burden with an élan that buoys the whole enterprise. Blunt Talk is the creation of Bored To Death impresario Jonathan Ames, who developed this series after Seth MacFarlane (who serves as executive producer) expressed a desire to build a new show around Stewart. Walter Blunt bears some resemblance to Ted Danson’s magazine editor on Bored. Both men are drug-abusing media figures with an air of self-confidence and a trail of failed romances behind them. But where Danson’s character was inclined to hunker down with his vaporizer when events intruded on his idyll, Blunt is a happy warrior who believes he can always twist a narrative in his favor. This indefatigable spirit is showcased in the opening moments of Blunt Talk, when Blunt tries to talk himself out of a solicitation charge while hopping around on the roof of his vintage Jaguar. That’s a zany setup, but Stewart also thrives in scenes that ask for less intensity. Although we only see glimpses of Blunt’s eponymous cable newsmagazine, the brief show-within-a-show scenes convincingly portray a TV host with the assuredness and creeping apathy that come from decades of experience. Blunt wraps up a segment on electronic child-tracking sensors by observing that he doesn’t much like the idea of “chipping” kids like they’re pets, “but I was also skeptical of the mobile phone, and I once did lose a dog.” With that, he shrugs off a complicated privacy issue so affably that it’s difficult not to laugh. Blunt is usually accompanied by Harry (Adrian Scarborough), a fellow veteran of the Falklands War who still addresses Blunt as “Major” and attends to his superior officer’s every need. Blunt’s producers serve a similar function: They have their own ideas for the show, but they’ll drop everything to address their host’s latest whim, essentially serving as an extension of his will. In functional terms, their deference allows Blunt to get himself into a wider range of trouble than he otherwise could achieve by himself, which is convenient in a loopy comedy like this one. Yet Blunt Talk also does the important work of justifying the secondary players’ subservient behavior. Blunt has warm, thoughtful interactions with everyone in his retinue—he’s both selfish and eager to help, a commander who truly cares for his troops. Ames has his peccadilloes. He loves to make his characters fixate on things, which is fine, but Ames treats these obsessions as if they’re funny on their face. One episode pursues a long, repetitive buildup to the revelation that one of Blunt’s producers is a hoarder with a lot of junk in his office. Hoarding is a thing you’ve probably heard of, and apparently that is enough of a punchline here. The writing is similarly lazy when it comes to drug humor. The mere fact of substance abuse strikes Ames as inherently hilarious, which gets tiresome—especially in the premiere, where Blunt and Harry consume every upper, downer, and in-betweener they can get their hands on. As you might have guessed by now, Blunt Talk sags when Stewart isn’t part of the action. The show makes admirable attempts to build out the world beyond Blunt, and the effort yields some dividends. Timm Sharp plays Jim, the aforementioned hoarder, with a believable neuroticism that mostly steers clear of caricature. Another producer, Celia (Dolly Wells), is the “quirky one” in a cast full of quirks, yet she too manages to maintain an endearing naturalism. The show slumps to a standstill, however, when it indulges in sappy scenes like one where young producer Martin (Karan Soni) mashes his face into the breasts of his matronly boss, Rosalie (Jacki Weaver), taking deep sniffs of her perfume. Such mild strangeness comes off as a watered-down version of Blunt’s more entertaining mania, which only reminds the viewer that Stewart isn’t on screen at the moment. But most of the time, Stewart is on screen, so most of the time, it’s hard to stop watching. His comic instincts are well-honed to the extent that an unwitting viewer would never guess the actor first made his mark in dramatic roles. Of course, Stewart is a known quantity to most of the audience, and maybe the world didn’t need further proof of his genius. Blunt Talk provides it anyway.